PR Newswire, NEW YORK, Mar. 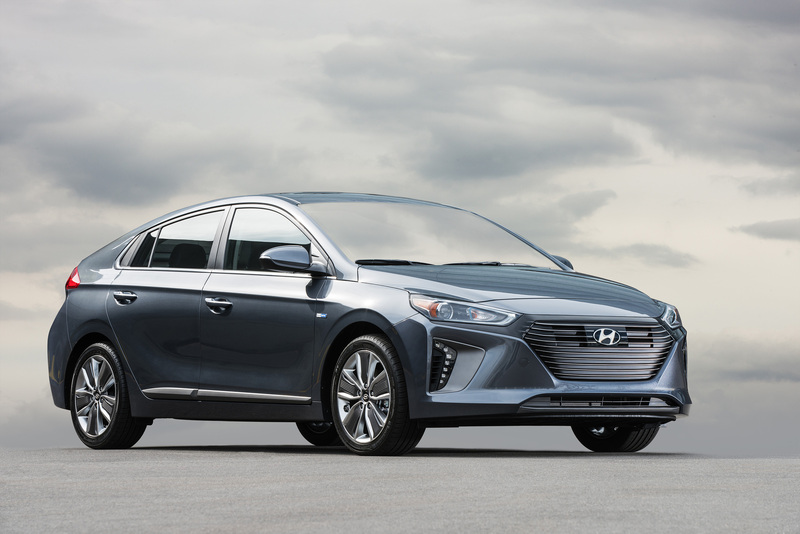 23, 2016 Hyundai Motor America today unveiled the Ioniq Hybrid, Plug-in Hybrid, and Electric models for the U.S. market at the New York International Auto Show. The Ioniq eco-focused vehicle is the first in the world to offer three distinct electrified powertrains on a single, dedicated vehicle platform. 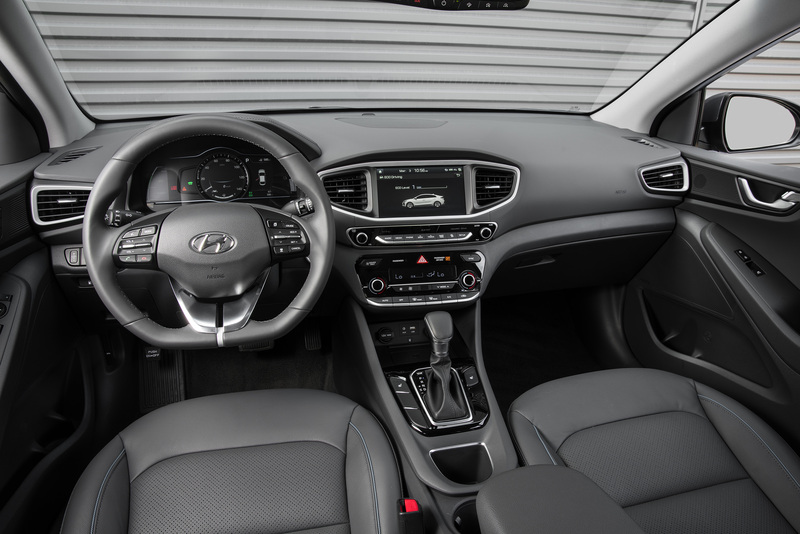 Hyundai’s approach for the Ioniq line delivers an uncompromising design and driving experience coupled with the latest in safety and convenience technologies, making it an appealing choice for a wide range of buyers. 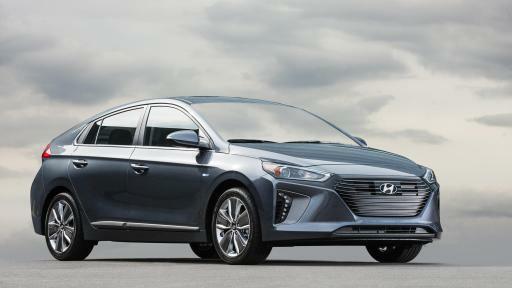 The Hyundai Ioniq is an important milestone in Hyundai’s global sustainability strategy. The driving experience inside Ioniq is enhanced through state-of-the art connectivity features like Apple CarPlay® and Android Auto®, as well as wireless charging of smartphones. Even more, the 7-inch TFT instrument cluster displays all key driver information with outstanding resolution. Ioniq also offers the very latest in advanced safety, including Automatic Emergency Braking with Pedestrian Detection, Lane Departure Warning, Blind Spot Detection, Rear Cross-Traffic Alert and Smart Cruise Control, for high levels of both active and passive vehicle safety. Ioniq models offer a sleek, aerodynamic silhouette with a class-leading 0.24 Cd derived from carefully designed surfaces. Its fluid exterior shape and smooth air flow channels emphasize aerodynamic body lines and design forms. Hyundai’s Ioniq line-up calls upon two key factors, efficiency and technology, in its design, which combine to create both a unique and forward-looking appearance. Throughout the entire development phase, engineers and designers worked closely to ensure that form and function evolved simultaneously in a complementary fashion. Distinguished exterior design sets Ioniq apart from its competitors as advanced technologies are integrated with the overall design. Developed for high energy efficiency without compromising driving performance, every Ioniq powertrain represents a unique and uncompromising solution towards a cleaner means of mobility. 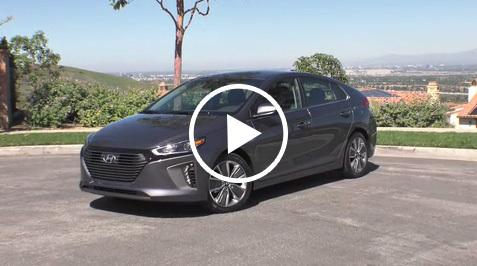 The Ioniq Hybrid and Ioniq Plug-in Hybrid both feature a new Kappa 1.6 direct-injected Atkinson-cycle four-cylinder engine with an unsurpassed thermal efficiency of 40 percent, delivering an estimated 104 horsepower and an estimated 109 lb.-ft. of torque. This engine has been specifically tailored to the hybrid application and is combined with a smooth shifting six-speed double-clutch transmission – differentiating Ioniq from its key competitors with a more dynamic and engaging driving experience. The high-efficiency electric motor has a pure electric driving mode and delivers instantaneous torque at low speeds, with available power-assist at higher vehicle speeds. The Ioniq Hybrid’s electric motor delivers an estimated 32 kW (43 horsepower) with an estimated maximum torque of 125 lb.-ft., powered by a lithium-ion polymer battery with 1.56 kWh capacity. The battery is efficiently positioned under the rear passenger seats. 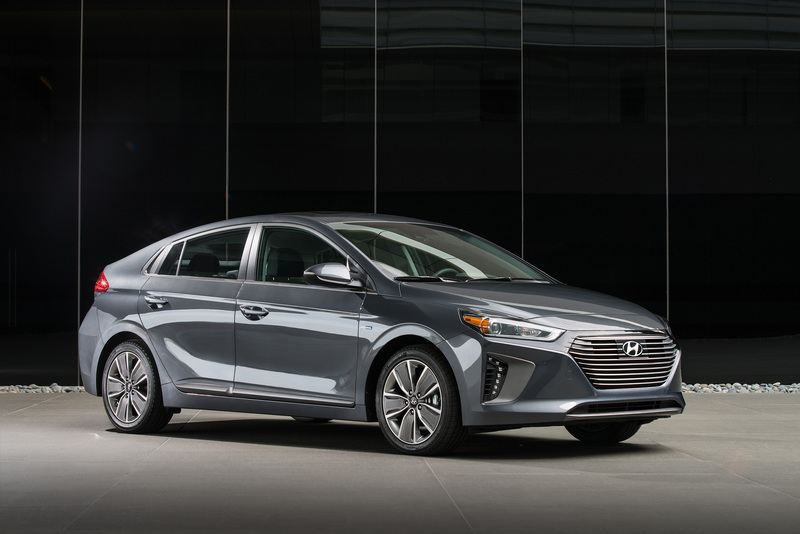 In combination with the 1.6-liter direct-injected engine, Ioniq Hybrid offers an estimated total system output of 139 horsepower while providing low emissions, outstanding efficiency and range. The Ioniq Plug-in Hybrid provides an estimated all-electric range of more than 25 miles, powered by a potent 8.9 kWh lithium-ion polymer battery. The Ioniq Plug-in’s estimated 45kW (60 horsepower) electric motor is coupled with the 1.6 direct-injected Atkinson four-cylinder Kappa engine. The Ioniq Electric offers pure electric mobility with a 28 kWh lithium-ion polymer battery for an estimated driving range of 110 miles. The Electric motor has an estimated maximum output of 88 kW (120 horsepower) and 215 lb.-ft. of torque through a single-speed reduction gear transmission. The Ioniq Electric has an estimated 125 MPGe rating. 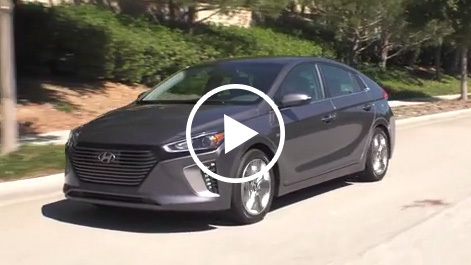 The Ioniq Hybrid and Plug-in both feature a six-speed EcoShift® dual-clutch transmission (DCT), which boasts best-in-class transfer efficiency through the use of low-friction bearings and low-viscosity transmission oil, and is able to achieve a unique mix of driving performance and fuel efficiency. Both the Ioniq Hybrid and the Plug-in use a dual-clutch transmission to engage the driver for a spirited and fun-to-drive character. This is an important differentiator from the majority of other Hybrid and Plug-in Hybrid cars that use a Continuously Variable Transmission, which are often criticized as having ‘rubber band-like’ acceleration. Enhancing the car’s fuel efficiency and dynamic driving characteristics, the driver can select either SPORT or ECO modes. The SPORT function holds lower gears longer and combines power from the engine and electric motor for maximum performance. In ECO mode, the DCT optimizes gear selection for efficiency, upshifting earlier to achieve class-leading fuel economy. Further, the powertrain components were designed to be compact and highly efficient. The combined extra weight of the Hybrid and Plug-in Hybrid technology therefore adds minimal weight to the Ioniq, but significantly increases its efficiency. Electric power for the Hybrid and the Plug-in, as well as for the Electric, is generated by a permanent magnet synchronous motor whose parts were optimized by reducing the thickness of core components by up to 10 percent and adopting rectangular-section copper wire to decrease core and copper loss. Hyundai uses a lithium-ion polymer battery pack for all Ioniq models which is 20 percent lighter than non-polymer lithium-ion batteries and can be shaped more optimally to the interior than standard cell format batteries. This also provides lower memory sensitivity, excellent charge and discharge efficiency, and outstanding maximum output. Both efficient packaging and a low center of gravity were taken into consideration as the battery system is located underneath the rear seats so that the passenger cabin and cargo area is uncompromised in the Ioniq Hybrid, offering a total interior volume of an estimated 122.7 cubic feet (more than Toyota Prius). Even the Ioniq Plug-in and the Ioniq Electric, despite larger batteries, both offer a generous total interior volume of an estimated 119.2 cubic feet. Charging the Ioniq Electric’s lithium-ion polymer battery up to 80 percent only takes about 20 minutes using a SAE Combo Level 3 DC, 100 kW fast-charger. An integrated In-Cable Control Box (ICCB) also allows drivers to charge their Ioniq at a standard household electric socket. In crafting the exterior appearance of Ioniq, Hyundai designers concentrated on its future-focused character, fundamental to its appeal. A fluid exterior shape and natural air flow channels emphasize aerodynamic body lines and surface volumes. A sporty, hatchback-like profile is inspired by aerodynamic efficiency, complementing the soft lines and surfaces that trace the car’s outline. These attributes combine to boost aerodynamics further, which, when combined with various other smart efficiency solutions, produce a class-leading 0.24 coefficient of drag. The front of the Ioniq Hybrid is characterized by the Bi-Xenon HID headlights surrounded by C-shaped LED positioning lamps. Hyundai’s signature hexagonal grille and vertical C-shaped LED daytime running lights further convey purity of design. Contrasting colors at the base of the bumper fascia add individual character and can be paired with two unique interior environments. 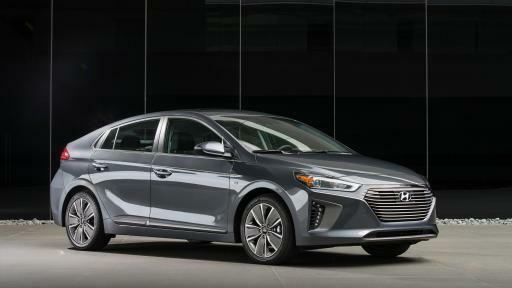 The color choices for Ioniq models include Black Noir Pearl, Symphony Air Silver, and Electric Blue Metallic, Ceramic White, Siena Brown and Summit Gray. The Ioniq Hybrid features specially-designed two-tone contrasting 15- or 17-inch alloy wheels. 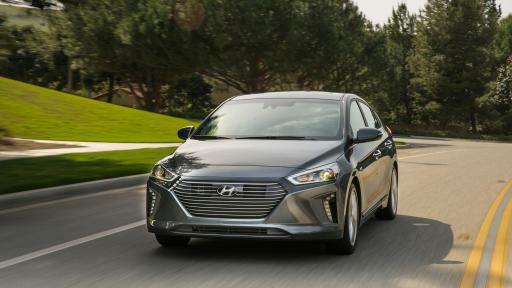 In addition to general exterior design details from the Hybrid, such as the hexagonal grille and the vertical C-shaped LED daytime running lights, the Ioniq Plug-in also features low-beam LED headlamps. The Plug-in also integrates a charging portal into the left front fender for the lithium-ion polymer battery. Specially-designed 16-inch alloy wheels further differentiate the Plug-in Hybrid model. Ioniq Electric conveys a unique front perspective: without a need for extensive powertrain cooling, the grille is a sleek and clean surface. The Electric model also features LED low-beam front headlamps and rear combination lamps with a unique pattern and identity for the rear view, as well as unique eco-spoke alloy wheels. In keeping with its exterior, the interior of Ioniq captures the model’s futuristic qualities, with a ‘Purified High-tech’ design concept. A smooth, elegant and clutter-free theme and efficient use of interior space complements a logical, structured approach applied to the layout of controls for intuitive operation. Materials for the interior were chosen with an ecologically-sensitive focus and are used to create a simple and clean look throughout the car, giving the interior a sleek, light and purified feel. The driver and passenger of the Electric model will also notice that there is more room between the front seats. This is achieved via a button-activated shift-by-wire system free of mechanical linkage. The Ioniq also features an electronic parking brake (EPB), conserving space in the center console. The Ioniq sleek silhouette and its simple, carefully wrought contours assist the efficient management of airflow around the exterior. Applications like front wheel air curtains, a rear spoiler and diffuser, side sill moldings, floor undercover and a closed-wheel design all contribute to the car’s high aerodynamic efficiency of 0.24 Cd. Additionally, the Hybrid and Plug-in hybrid feature a three-stage active air flap integrated with the front grille, while a sleek, closed front fascia differentiates the Electric model. To provide a pleasant, comfortable and refreshing interior climate without using unnecessary amounts of energy, the Ioniq climate control can be switched to an efficient operation mode. Recirculated air is maximized when air-conditioning or heating, reducing ventilation losses and increasing the overall efficiency of the system. Also, the fully-automatic climate control can be set to ‘Driver only’ mode, thereby reducing the load of both air-conditioning and heating on the overall powertrain. Ioniq also allows drivers to integrate their smartphone with the vehicle’s infotainment system by providing both Apple CarPlay® and Android Auto®. Both systems enable users to connect their devices to activate music, telephone or navigation functions with lower distraction levels. Ioniq also offers a wireless inductive-charging pad (Qi standard) for mobile phones. Ioniq sought significant weight reduction targets without compromising fun-to-drive and comfort characteristics. Ioniq uses aluminum in the hood and tailgate, reducing weight by 27 lbs. compared with conventional steel and no measurable disadvantages in noise or vibration. In addition, the lead-acid auxiliary 12V battery found in competitors’ hybrid models has been omitted, resulting in an approximate 26-pound reduction in weight. Lightweighting also extended to less obvious areas like the cargo-screen cover. With higher usage of lightweight components and a more compact build, the cargo-screen cover is about 25 percent lighter than the types used in other Hyundai models. The driving performance of the Ioniq line-up is among the best in its segment due to a powertrain that is adapted to deliver efficient mobility without compromise. Ride and handling, as well as noise, vibration and harshness levels, are tuned towards superior ride quality, while insulation in the instrument panel minimizes engine compartment noise intrusion. Damping in the floor panels, as well as enhanced A- and B- pillar insulation, thicker window glass and noise-cancelling film on the windshield, further improve the quiet and comfortable driving experience. Ioniq Hybrid and Plug-in feature a sophisticated multi-link rear suspension system with dual lower control arms, minimizing ride and handling compromises often associated with less sophisticated suspension geometry. In addition, extensive use of aluminum in front and rear suspension components saves around 26 lbs. of weight compared with conventional materials. A reduction of five lbs. per front lower arm unit saves 10 lbs. at the front suspension, while nearly 16 lbs. is reduced at the rear suspension. In addition, the placement of the battery systems below the rear seats provides a lower center of gravity for more responsive handling. The Ioniq Electric applies a torsion-beam rear axle, providing more space for the 28 kWh lithium-ion polymer batteries, placed below the rear seats. Ioniq’s responsiveness and feedback from the steering system is clear and precise, with a quick steering ratio for a sporty and responsive feel. Braking force is optimized for maximum efficiency from the regenerative braking system, helping Ioniq to maintain a steady state of charge (SOC). Regenerative braking also operates with reduced noise, using a third-generation recuperating stopping system. An Integrated Brake Assist Unit (iBAU) and Pressure Source Unit (PSU) also contribute to quieter operation. This helps ensure ultra-low friction for maximum energy recuperation and efficiency levels. Michelin® tires give Ioniq enhanced levels of efficiency, as the car is fitted with low-rolling-resistance tires for 15-, 16- and 17-inch wheels, plus the car’s larger 17-inch wheels (Ioniq Hybrid) are fitted with high-silica tires for better all-around performance. The multi-link suspension system of Ioniq Hybrid and Plug-in has been adapted to work most efficiently with low-rolling-resistance tires. The Ioniq line-up delivers great driver and passenger convenience, bringing to the segment a range of considerations for which other Hybrid, Plug-in Hybrid and Electric vehicles may have compromised. All Hybrid components are cleverly packaged to maximize space and flexibility of the interior. In fact, the Ioniq Hybrid offers best-in-class cargo space by positioning the battery underneath the rear seats. Moreover, the rear seats can fold down, providing an estimated 26.5 cubic feet of cargo area volume, allowing large pieces of luggage to be stowed with ease. All Ioniq models also offer generous front and rear headroom, shoulder and leg room, while a memory driver’s seat and heated front seats offer additional comfort. 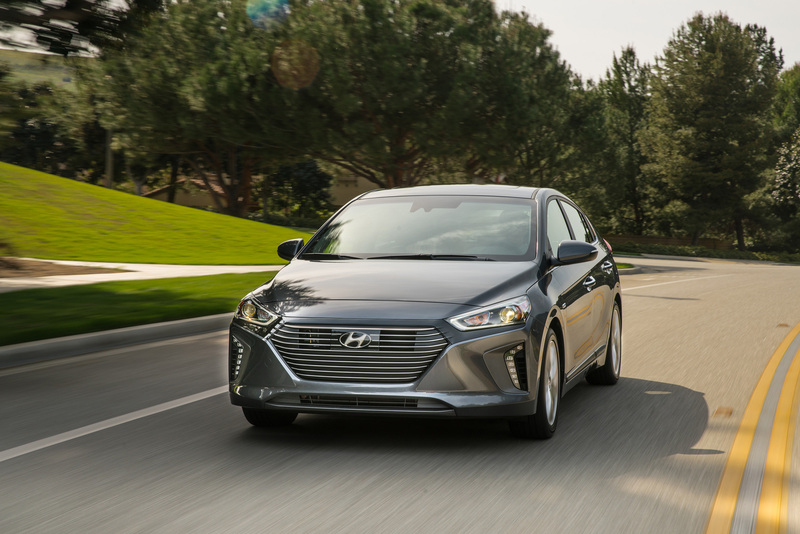 The Ioniq lineup offers the Hyundai Blue Link® connected car system with enhanced safety, diagnostic, remote and guidance services. Blue Link brings connectivity directly into the car with technology like Remote Start with Climate Control, Destination Search powered by Google®, Remote Door Lock/Unlock, Car Finder, Enhanced Roadside Assistance, and Stolen Vehicle Recovery. 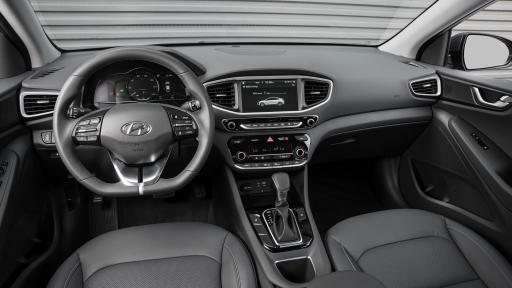 Blue Link features can be accessed via buttons on the rearview mirror, the MyHyundai.com web portal, or via the Blue Link smartphone app. Some features can also be controlled via Android Wear™ and Apple Watch™ smartwatch apps. Owners of Ioniq Plug-in and Electric will also be able manage and monitor their car’s charging schedule remotely via the Blue Link® smartphone app. Charge scheduling is ideal for individuals that have lower electricity rates during off-peak hours. Ioniq’s light-yet-rigid body is the result of advanced design, construction methods and materials. Featuring 53 percent Advanced High Strength Steel, the chassis benefits from superior rigidity for responsive handling and safety, with high impact-energy absorption and minimized cabin distortion to protect passengers in the event of a collision. This rigid structure also leverages 475 feet of advanced structural adhesives in its design, simultaneously yielding both lightweighting and rigidity benefits. A host of innovative active and passive safety features help protect Ioniq drivers and passengers. These electronic systems are class-leading as Ioniq continues to break the mold for alternative fuel vehicle safety standards. The long list of active safety features includes Blind Spot Detection, which works with Lane Change Assist and Rear Cross-Traffic Alert to warn the driver of any surrounding vehicles, passengers or objects that could lead to a collision. A Lane Departure Warning System (LDWS) is also offered, which sounds an alarm as the car moves over lane lines. The Ioniq is also fitted with Automatic Emergency Braking (AEB) with Pedestrian Detection, an advanced active safety feature that alerts drivers to emergency situations, even braking automatically as required. With sensor-fusion technology that utilizes the front radar and camera sensors, AEB operates in three stages. Initially warning the driver visually and acoustically, it controls the brake according to the collision danger stage, applying maximum braking immediately before an imminent collision. When a vehicle or pedestrian is sensed in front of the car, the system is activated, operating at speeds of more than 5 mph, and minimizes damage when a collision is otherwise unavoidable. Using front radar sensors, Smart Cruise Control allows a constant speed and following distance to be maintained from the vehicle ahead without depressing the accelerator or brake pedals; it is automatically cancelled when speed drops to 5 mph or below. Ioniq Electric takes it a step further by providing Advanced Smart Cruise Control, providing fully automatic stop/start function as well. A Tire Pressure Monitoring System also helps ensure each individual tire is properly inflated. A total of seven airbags, including a knee airbag for the driver, help protect the vehicle’s occupants in the event of a collision. Body structure improvements, complemented by a high-strength fiber-reinforced rear bumper fascia make the entire Ioniq line-up strong and durable in the event of a crash. All technical specifications and emission values are preliminary target values and subject to homologation.